Spectacular aerial footage which completes the report on your event. These days, that's a piece of cake, thanks to the drone. This small and practical unmanned quadrocopter flies high and humming above your audience. The result: aerial footage of your meeting, event, congress or teambuilding. What footage do you expect? And what shots do you really need? Make sure that beforehand you thoroughly discuss with the drone pilot what footage and images he definitely ought to make. Write down a script. This is the best briefing you could give. The drone companies are popping out of the ground like mushrooms. But the quality of the work and the footage may vary immensely between different companies. Therefore, make sure you gather a lot of information about the supplier you want to do business with. Ask for references and for examples of previous work. Drones make a humming sound and cause air displacement. Make sure you take this into account. Shooting footage of an interesting speaker with a drone is not a good idea, so you have to find alternatives. Drones can be dangerous. Especially when there's people around. Discuss the possible risks with the drone operator. Make sure he knows the room in which he has to fly and navigate. Inform him of any potential obstacles and also of antennas or other objects that might cause interference. Does he track the drone or is he controlling it from a fixed position behind a screen? Urge the pilot to constantly keep an eye on the quadrocopter. Do you want to use the drone on a specific location (exhibition hall, festivals, etc...)? Then make sure you get an approval from the location. And also inquire what you may film and where. 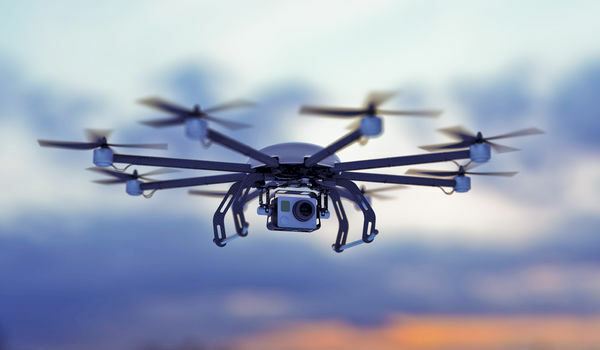 Complaints about the use of drones usually have to do with privacy or disturbing public airspace. In many European countries and the US laws are already in effect which regulate these matters. In this legislation, a distinction is usually made between private and professional use.